Below is a log of the current event updates for Donald O'Connor's appearances (Back in the Old Routine) and for the updates to our Donald O'Connor Pages (What's New), more or less as they appeared on the front page of our Donald O'Connor Web Site. In other words, this is what you missed. Entries start in November 1999 and will be expanded should we dig up any old text. (Web Site premiered March 17th 1999). November 5th 1999, Donald took a break from his week long Palm Springs Follies appearance to go to Riverside CA for an evening in A USO Style Salute to the Medal of Honor Winners. November 20th 1999, Donald received a lifetime achievement award at the Opening of the El Portal Center for the Arts in North Hollywood. Visit the El Portal web page, look at the invitation, and check out the press release and this article appeared on Playbill. Here's our account of the event. December 16th 1999 Donald presided over the opening of a new theatre subbing for an ailing Mickey Rooney, along with Van Johnson and Gloria DeHaven. Also, we've heard that Donald will be appearing on stage in Florida, this spring doing Love Letters with Margaret O'Brien. More details when we learn them. 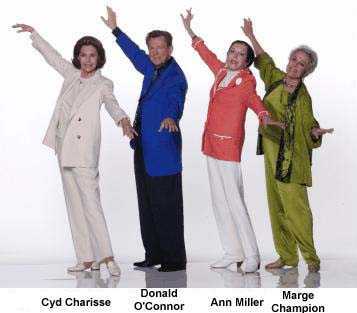 On March 22 through April 9 2000 Donald O'Connor and Margaret O'Brien will appear together in "Love Letters". That will be at The Music Box Theatre in Port Charlotte, Florida at the Promenades Mall, US 41 and Harbor Blvd. Call 941-743-3663 for tickets. The March 22 appearance of Donald O'Connor in "Love Letters" has been cancelled. The Music Box Theatre in FL has been reported closed, and they aren't returning calls (941-743-3663). May 26th 2000 Donald sang at the opening of the Georgia Frontiere Pavilion at Sedona Cultural Park in Arizona. May and June 2000 Donald appeared in Promos on TCM (Turner Classic Movies) for their June theme "Footwork: Dance in the Movies" (picture). August 1st - 6th 2000, Donald appeared at The St. Louis Tap Festival, For more information visit The Tap Heritage page. August 10th 2000 Donald appeared in Ohio at Croatian Hall in Eastlake Ohio and on Aug 12th 2000 at Powers Hall in Youngstown. October 11th 2000 Donald O'Connor was honored with the Mary Pickford Achievement Award, presented by the Screen Smart Set Auxiliary of the Motion Picture & Television Fund, at the 32nd annual Celebrity Fashion Show at the Beverly Wilshire Hotel in Beverly Hills, CA. 11/21/99 New contests on our Games Pages and the results of our previous contests. 11/26/99 we have ever more Lobby Cards, so many we had to move some over to the Francis exhibit. Our Regular visitors will notice the longer download time, that's because there is a more detailed, quote-filled, 70% more pictures, animated, chapter divided, Donald O'Connor Biography below! 12/99 Happy Holidays! Have a look at our Donald O'Connor Christmas Page. 12/13/99 we have up our accounts of Donald's live appearance in Riverside and at the El Portal Center for the Arts. And a couple new photos in our Photo Gallery. Remember the deadline for our contests on the Games Pages is December 31st. We have a Singin' in the Rain quiz this month. 1/16/00 announcing a new page, connected to our Television page, an episode guide to Donald's Colgate Comedy Hours. Also a new version of the Games Pages is up and the new contest deadline is February 29th (Leap Day!). In our Photo Gallery we have up six new photos. 2/6/00 we have added an in-site Search Engine for your convenience, and will gradually be adding search buttons to the disclaimer box on each page. 3/19/00 A new games page is up, with a new deadline May 15th. Our Lobby Card display now has a complete set of Call Me Madam images. As well as some other new (to us) cards. 4/2/00 Just for a little change of pace we've added new backgrounds to some of the pages, those on the top half of the menu bar. 5/3/00 Have a look at the Press Release for a San Francisco Event on National Tap Dance Day (May 25th). 7/2/00 The new Games Page is up. We have a special 4th of July Page and five new photos in our Photo Gallery. 08/01/00 Donald O'Connor Birthday Countdown to August 28th. HAPPY BIRTHDAY DONALD! And while we're at it, of course it was Peggy Ryan's birthday too and we have a special web page devoted to the two of them. 8/16/00 The links page has been updated with some new links, fixed links and Donald's autograph address smack dab on top. 8/28/00 We added nine new pictures to the Photo Gallery in honor of Donald's 75th birthday. 9/18/00 Our updated Games Page is finally up, with a Nov. 15th deadline. 9/04/00 We made some updates to the on-line section, including a link to a Yahoo Club.